First flyball dogs are always special. Some are challenging to train, others are quick studies who catch on right away. 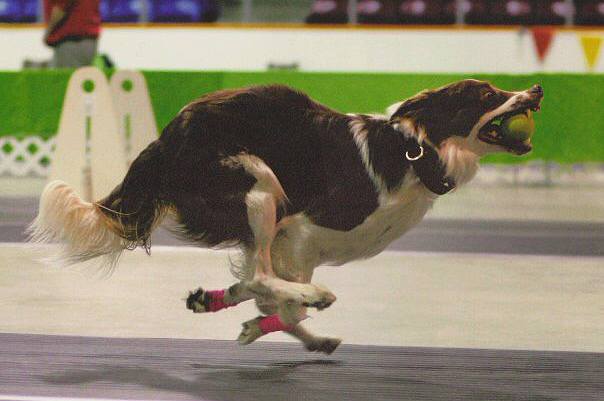 Very few first flyball dogs go on to run as fast, for as long, and set as many world records as Fever Hilliker. Fever debuted in April, 2001 and ran his last race in December 2012. Running on Springloaded, Fever and Levi had many accomplishments throughout his 11-year career: •	First US team to break 16 seconds. • EIGHT separate NAFA World Records (Regular & Multibreed) •	Multibreed World Record of 15.36, set in September, 2004, stood for an unprecedented 8.5 years. •	2009 Can Am Multibreed Grand Champions (at the age of 9) •	Best career time 3.69 over 11", one of the fastest border collies of his time Aside from this impressive list, Fever had all the intangibles of a truly great flyball dog. He raced hard, with all his heart, and no one who watched him play will ever forget him.